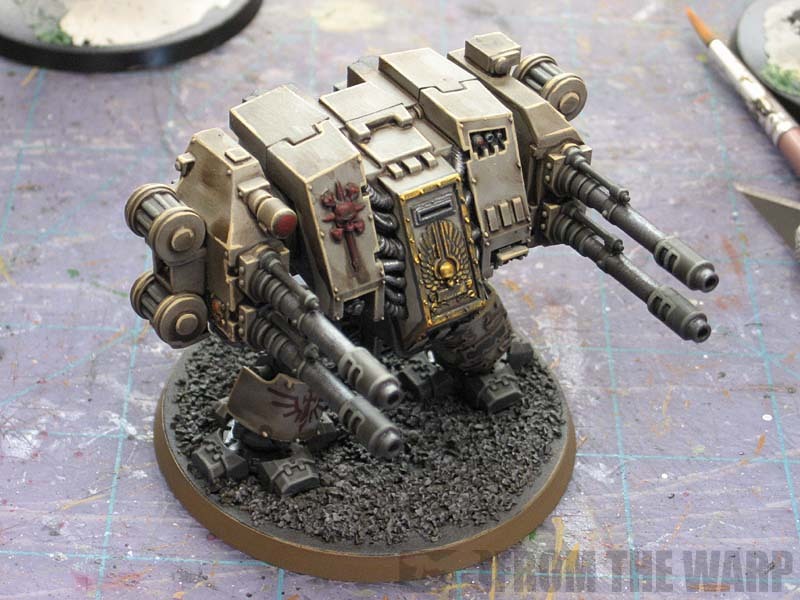 Forge World's new Basilisk model is gorgeous. I don't play Fantasy, but I love this model. This thing is so cool looking. I don't know how effective it is on the table, but it would be worth fielding just to look at it. The trouble is, what if I don't want him on those rocks? Lots of times, it seems like larger models (like this beauty) come with a little bit added to their standard base. It's a nice feature in most cases, but what happens when it's not what you want to use? 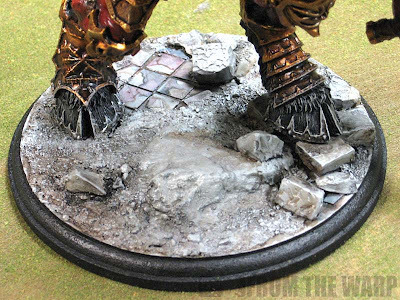 What if you've established a nice, solid basing theme and "rocks" just don't fit in with it? If the model is attached to the basing element, you're left facing lots of work to change it. I'm betting most of us are going to do our best to find a way to incorporate it into our existing theme. Maybe if we're lucky, the model can be extracted from the element in question and we can build our own piece to set our monster on top of relatively easily. Sometimes you get lucky like I did with this model I did a long time ago. The dragon started out perched on the rocks. I was lucky that it only took a little bit of cutting to get him removed from the rocks so I could turn him around and use the base in another way. These are the perfect size and they don't come "attached" to their base theme. You can replace the standard base with anything under the sun in terms of resin or you can make your own just as easy. You can put them on a blank base with nothing more than some sand or you can go all out and use the one they come with and add elements as you wish. In this case, all I did was use the standard base and add a smaller element on top of that to fit in with my friend's existing basing theme. Resin base manufacturers have gotten really good about providing us players with larger bases that are themed to match the smaller ones. 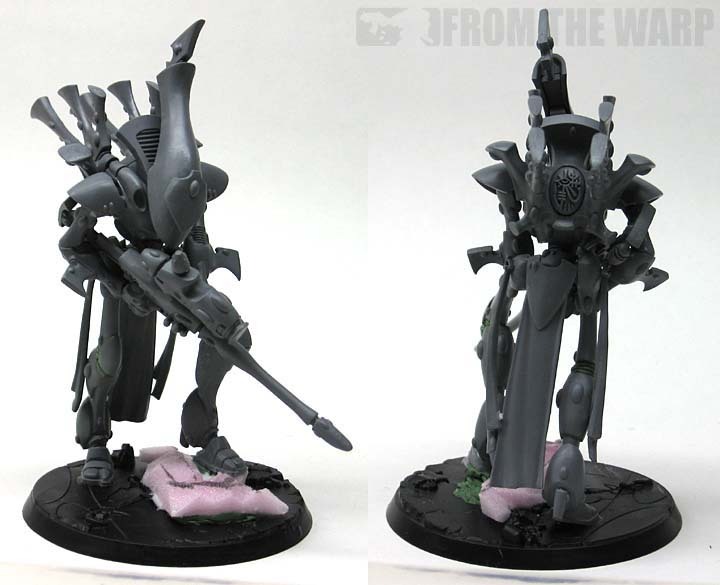 This makes it super easy to match our larger models to our smaller ones and keep our basing theme consistent. As long as your monster doesn't already come attached to his terrain. Even though I'm complaining about models being attached to their basing elements and having to surgically remove them if it's even possible, there are models that don't come with bases and you're forced to build your own (or try the resin route if you can find something big enough). This guy (Forge World Bloodthirster) doesn't even come with a round base. He had a square one, but that wasn't going to help me. I ended up building one to create the whole theme of the army. This can be as much work as trying to get him separated from any little element he might have come attached to in the beginning. I appreciate the manufacturers giving us a little bit extra to put our models on. I just wish they weren't permanently fixed to them. Maybe include the base elements as extra that we can use if we want and it fits into our existing theme. Otherwise we have a blank canvas to work with so that our new centerpiece monster blends in perfectly with the rest of our force. How am I going to do silly things like this if I have to cut away the attached basing theme beforehand? If anyone has one of the Basilisk models and it does come separate from the rock outcropping, please don't tell me. I don't want to know about it. 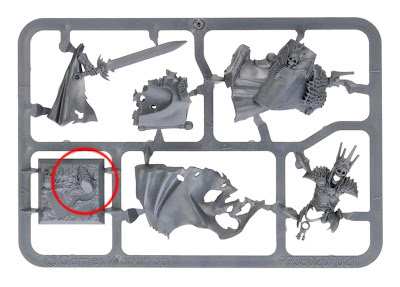 Apparently some of the new Vampire Counts models (in this case, the Wight King) are partially attached to their bases. This was brought up in one of the comments below and I remembered seeing this model the other day. It didn't register at that point, but after finding it, I can see how this might be a little problematic for those folks looking to mount a simple infantry model on a resin base to fit the theme of their army. 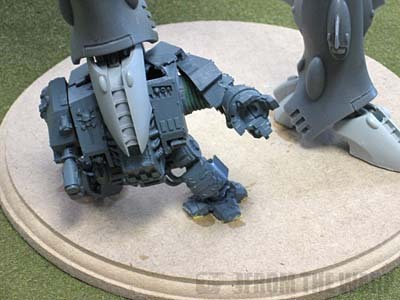 I suppose resculpting a foot can't be that hard, but it's the fact that I'd have to do it if I want this guy on a different base. I don't know, but it doesn't look as if it comes attached to the base. Also the skaven mounted on the giant rat... having his claw attached to that piece of rock rests dynamism to it i think.... agh.. 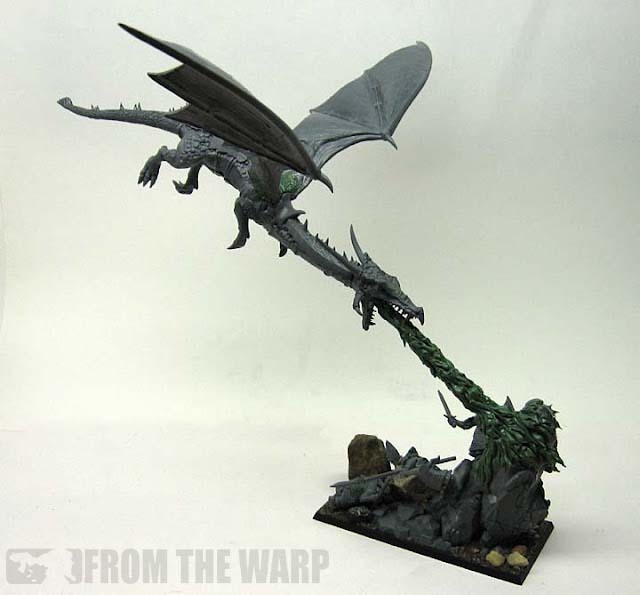 This reminds me of the horror I experienced trying to re-position the Gaulrauch two-headed chaos dragon from years ago. Since it was a metal model and I didn't have my dremel yet, I spent a very, very long time chopping away at the log bit to get it positioned the way I wanted it and keep it from being top heavy. Brother Loring: Really. Just like that? dancing platypuss: That's a good point, wanting to use the base elements from one modle under another one and not being able. Krisken: i'm not sure I would have even tried to separate them myself. Aye, I had the same problem with a metal empire warrior priest standing on a stone. Which was cast in metal as a single piece. I think it was worth it Ron. It's still one of my favorite models and I use him as Fateweaver. 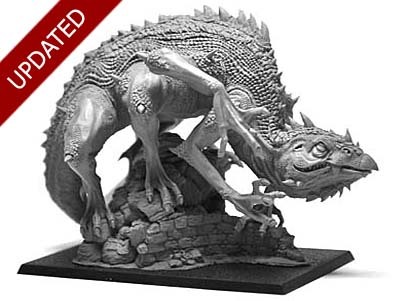 the basilisk model from forge world is a multi piece kit. all the arms and legs are seperate as is the head and the base is not attached to the model. the picture above does show a clear gap where the legs touch the base. good post anyway. still relevant to many models, just not the forge world basilisk. Mr. Esty: Why did you remove your comment? It was a fair question. voranoth: At least you were able to make it work for you in some way and get it to blend it. Krisken: Wonderful work on that guy! GavCee: I knew it. As soon as I posted this, I figured that would be the case. Unbelievable. lol... its still a really good point though. i have models i love but they are "based" straight out of the box. when i first saw the basilisk i thought it was prebased too but after looking at it i noticed the shadows under the feet. strangley though its the base i like, the model im not very keen on, if your interested ill buy it and sell you the creature for a cheaper rate but ill keep the base. GavCee: Tempting as that may be, I'm not sure how to fit one of these into my Space Marine force. If I can think of a way though, I'll let you know for sure. I'd have to disagree on the basilisk, it's an awful chameleon-esq monstrosity. But really enjoyed the rest of the post, the dragon conversion is inspired and the crushed dreadnought is a nice touch. 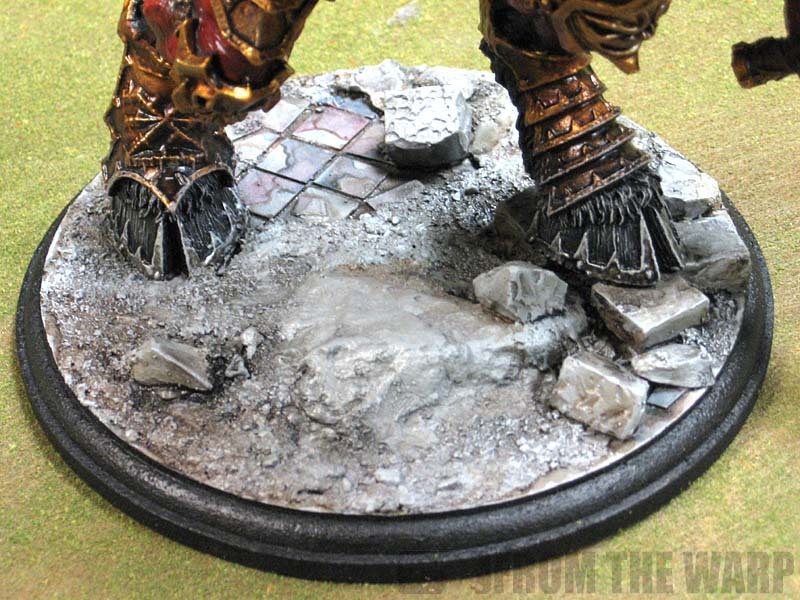 Might also be worth noting that most of the new Fantasy foot characters now come with 'special' bases and I've noticed feet are sometimes attached?! Meaning you can't just swap out the bases. It's a bit presumptuous. Rusty: We'll say the dragon is personal taste, but you're spot on about the Fantasy models and bases. Having a single foot attached might benefit in making the model to base connection stronger, but it comes at the expense of making it very problematic in swapping out the base for something else. Curses.....why does the Basilisk have to be detachable from the base. This is one of those typical minis I love, yet have no use for what so ever......annoying!